This Panawal Junior is very much like its senior but 200-250 grams lighter making it more comfortable in one's grip. You don't feel like lifting a heavy tool. Just the right weight! 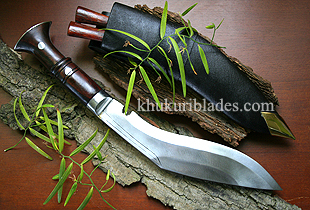 The very popular Kukri "The Great Panawal", known for its strong blade, sturdier handle (full flat tang) and its great weight behind the blade making it very affective for heavy duty chopping is more like an Axe. Few people might want to buy this beauty but later on might decide on its drawback thinking "is'nt it a little too heavier for me and for my hand? ", will it not hurt my palm or make me tired?. If you are the person with these question then, this "Panawal Junior" Kukri is the answer to these queries. This Panawal Junior is very much like its senior but 200-250 gms lighter in weight making it more comfortable in one's grip. You don't feel like lifting a heavy tool. The weight is just right for any kind of cutting and chopping without making you tire so quickly and gentle to your palm.